Some trips are spontaneous: Pack the bags and take off at a moment’s notice! Then there is our trip. On April 20, 2012, the Union High School marching band announced they had been accepted to participate in the 2013 Macy’s Thanksgiving Day Parade in New York City. Miles plays in the Drumline in Union’s band – the Renegade Regiment. Once we got the word about the parade, the entire family said, “We’re going!”. 19 months later, we’re heading to the Big City. There are 12 members of our travel party. Joining us are my Mom (PK) and Dad (KK), Uncle Joe & Aunt Judy, brother Scott and his wife, Erin, and Erin’s grandmother. Let the good times roll! One interesting sidebar of this trip is that the last time Stephanie, Scott and I were in New York City was when Stephanie was 8 months pregnant with Miles, in 1997. It is only fitting that he is the reason we are here this go-round. Our travel party left in three waves. The first group to leave was KK, PK, Joe & Judy. These four brave souls were driving to NY and wanted to allow plenty of time for a leisurely drive. KK & PK left the house at 4:34 AM on Saturday and picked up Joe & Judy by 5:00 AM. We stayed the night with my parents the night of the 22nd, and Miles and I got up and saw them off on the 23rd. The grandparents were very excited to see Miles. I think it was the least he could do! PK and KK with Miles. A 4:30 departure is *very* early by our standards. But they had a great reason. 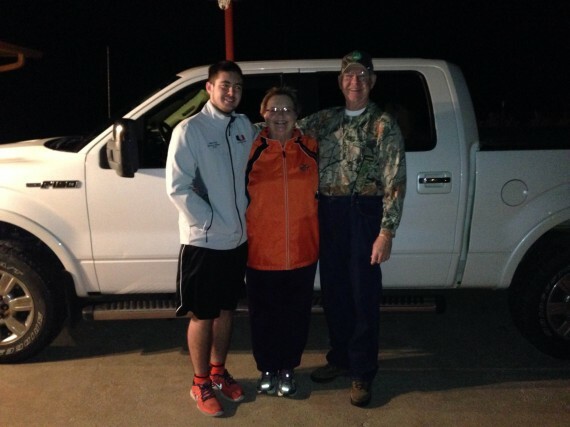 They were staying the night in Evansville, Indiana, their first night on the road and wanted to be checked in by 7pm – the kickoff of the Oklahoma State vs. Baylor football game. The arrival by 7 and the football game were both highly successful. 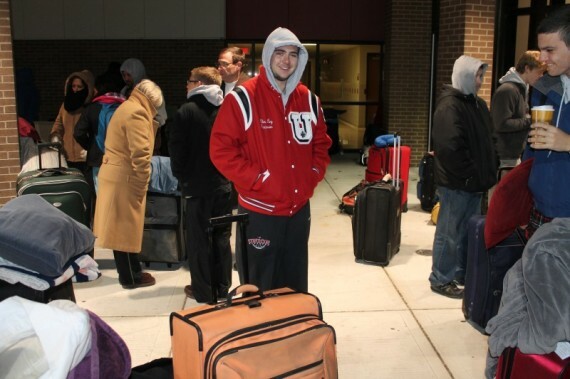 Roll call for the Union Band and the travel party was 5:00AM for a 5:30 departure. Nine charter buses pulled into the parking lot at 5:15 and took their positions. At least from the outside, I would say these are the Cadillacs of charter buses. Not only did they look sharp, but they also boasted on-board WiFi. A very cold Miles waiting for his bus to show up. Miles and his friend, Caleb. I will admit they look pretty happy. Nine buses ready for an All-Nighter. The buses were to drive straight through to New York, and it ultimately took about 27 hours. 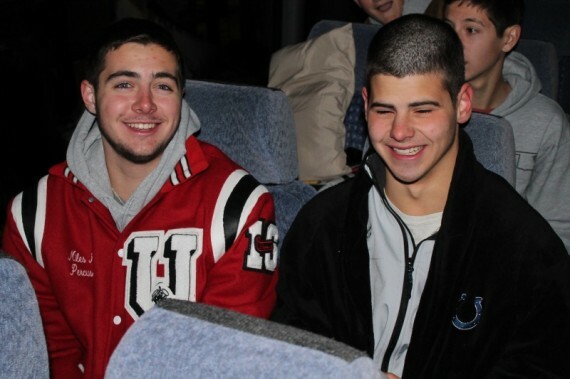 Although I am certain they had a lot of fun, I am glad I wasn’t on one of those buses. The remaining 7 of us left on Monday. We had a 5:10PM flight and we showed up at the airport several hours early. The ticket agent at the Southwest desk confirmed we were flying into LaGuardia in NYC, and we mentioned we were going to the Macy’s parade. Her eyes lit up and she said that when she was 16 years old, she had gone to the Macy’s parade and she still remembers it vividly to this day. I would guess she was probably in her 50s, so I was very excited to hear that. I hope that this trip remains a vivid memory for our kids as well. 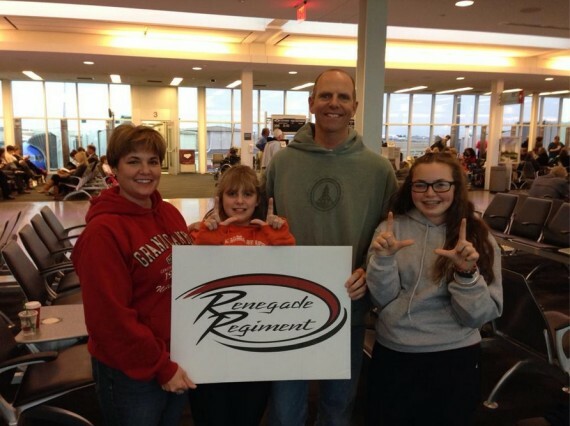 Before we boarded our plane, Scott took a picture of Stephanie, the girls, and myself holding our Renegade Regiment sign. I had my eyes closed, Stephanie was yelling at the girls, and in the end it only took three attempts to get a decent picture. Not a promising sign for the next 500 group photos we’re going to take on this trip. This picture only took three tries. We originally had a 1 hour layover in St. Louis, but our connecting flight was pushed back 90 minutes. Once we finally boarded the plane, the pilot told us our plane had come from San Fransisco and this was the cause of the delay. President Obama was in SF today, which basically brought all air travel to a temporary screeching halt. So yes, we were 90 minutes late getting into NYC: Thanks Obama! Marissa is loving air travel. Today was her first time to fly and she couldn’t be happier. She sat next to me on the first leg and next to Stephanie on the second. She was sufficiently impressed with the view from 30,000 feet. I will give LaGuardia the benefit of the doubt and assume that the rest of the airport is very nice, but the section we walked through from our gate to baggage claim was a dump. Cramped, dark and dirty. Doesn’t exactly say “Welcome to New York”. We had reserved a passenger van to take us from the airport to our hotel in East Rutherford, New Jersey. We used Super Shuttle for this service and it was a great experience. When we landed, I had a voicemail and a text from the driver letting me know he was waiting outside baggage claim. Our Private Ride to New Jersey. When I made the reservation, I was told there could be up to $20 in tolls on our route. I asked the driver, but he looked at me like I was crazy. There are no tolls. Not only that, but he took us on a route that drove us right through Times Square, the Lincoln Tunnel and some great views of the NYC skyline. 45 minutes later, we were at our hotel. 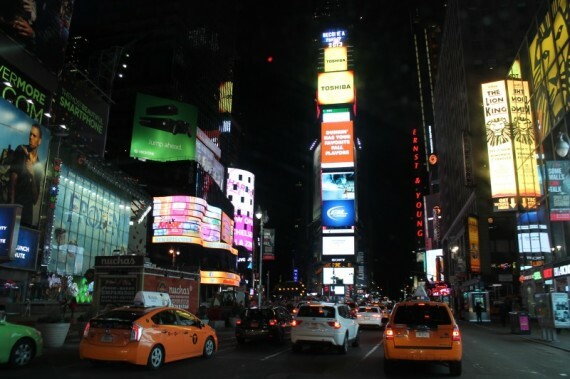 Driving through Times Square after Midnight was amazing. The streets and sidewalk were lit up so bright by the landmark lights that it literally looked like it could have been the middle of the day. Times Square. Hello New York! Even though it was after 1:00AM, KK and PK were up waiting for us when we arrived. KK greeted us at the front door and visited with us while we checked in. KK was very impressed with how full we made the luggage cart was and insisted he take a picture of it. Once we found our rooms, we had a pow-wow in KK & PK’s room to talk about our plans for the next day. We plan to be on the 9AM courtesy van from our hotel to Secaucus Station for our first train ride into the city. It will be fun, and 9AM will be early. Your observation regarding the portion of the terminal home to Southwest Airlines is spot on. It is only in the South West that Southwest gets any respect . . . They have had to muscle their way to the top there as well!! Enjoy the rest of your travels! What an exciting thing to do! New York will never br the same now that the Kings have arrived! Ill be watcing for you on tv from OK. XO! What a wonderful and exciting adventure for your family…Enjoy..and Happy Thanksgiving to you all! Ken, look like a lot of fun. Just might do that myself when I retire March 01, 2014. I have been to Buffalo, New York, but never to New York City, Madison Square Garden, but I am going to put that trip on my bucket list. Have enough fun for me. I am all excited just looking at the pictures you posted and just from reading all about the trip. Can’t wait myself.